Disability politics, adventures in tutoring, and other fun stuff by an arthritic narcoleptic. There's so much to post -- for instance, I am working again -- YAY ME! as a special education / class within a class teacher at the high school. This is good and bad. Good: I really love my kids. They're such strong, amazing, and yes, bright kids. Bad: classroom management. I teach two sections of learning strategies, which is like a graded study hall. I'm supposed to be teaching study skills, but I'm really just trying to keep my kids from destroying each other. I've always relied on instruction to control the class -- kids getting restless, I change up what I'm doing. When the class is mostly study hall, I can't do that. Oh, I got an ipad. I want one for J so badly. I'm saving up, but we also got a new roof on our house, which depleted both ours and my mom's reserves (thanks mom!). It's nice not having to run adjust the tarps and the drip containers every time it rains. Oh yeah, the point of this post: ipad mini giveaway. I get extra points in the giveaway if I post about it. An ipad mini right really work for J -- it's bigger than an iphone, which is too small for her to use well, but cheaper and smaller than an ipad. Smart Apps for Kids is doing the giveaway. I love Smart Apps for kids -- 85% of the good free apps of the day are too young for my kids at school, but man, the babies love them. Both Dominic and Olivia use the ipads to play all sorts of learning, sorting, letter and number Id type games. This is both good and bad because I can't bring the ipad out without Dominic throwing a tantrum. And when it's time to take it away.... yikes! 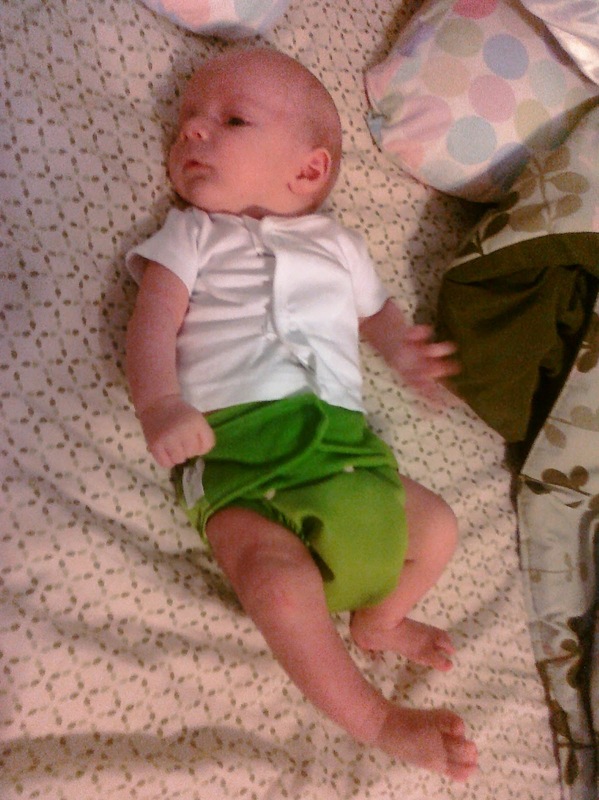 Dominic rocking the Gro-Vias at about 6 weeks old. 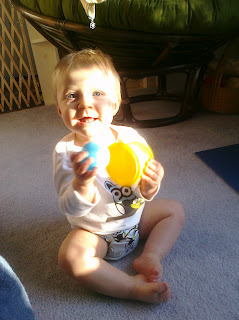 So, yeah, I'm Mommy-blogging in an attempt to get myself writing again. And yes, I'm product reviewing cloth diapers. 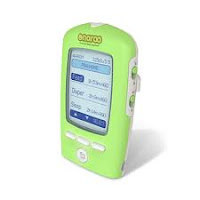 But although I've won a few things from GroVia-- my favorite cloth diaper company -- in a facebook contest, this review isn't solicited or sponsored by them. I think they have a blog affiliate program -- I'll look it up if I finish this entry. Right now, that's totally unlikely considering O is sitting on my lap, practicing what I can only assume to be some sort of Kung-Fu with a red pen, which I am letting her do in an attempt to keep her keys off the keyboard. First of all, as strange as it seems, I just took it as a no-brainer that I'd cloth diaper. I have no idea why. Maybe because I remember my little sister in cloth diapers in the early 80s, maybe because I use "mamma cloth" -- non-disposable feminine care items because disposable products are so hard on my skin.Really, I'm not that crunchy. I love my fast food and technology too much to claim to be more-environmentally-responsible-than-thou. But because my skin reacts so badly to disposable products, I really wondered about how my babies would do with disposable diapers. Apparently I left the hospital with a diaper rash as an infant and never wore disposable diapers since. D also left the hospital with a bad diaper rash. It looks like he's inherited my skin, poor baby. So, it's been a long, strange, poopy journey to where we are, 17 months later, happily in cloth most of the time. 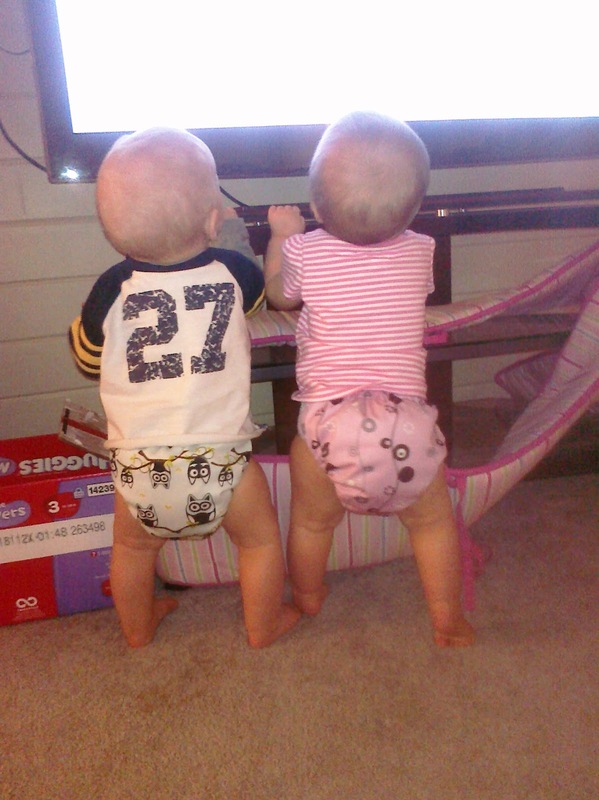 We do go through 1 jumbo package of Huggies or Luvs a month. (Pampers give O a terrible rash). 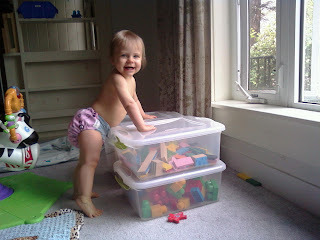 Up until this last month, we sent the babies to day care in disposables and used them when we traveled. We've finally gotten a big enough stash of cloth (and tight enough on money) that we've started sending the babies to daycare in GroVias and it's much less traumatic than I thought it would be. I won't go into all the types of cloth diapers there are -- a good site like Diaper Junction will tell you that. But I will give a brief primer on the diapers I ended up trying: Bum Genius 4.0s are a pocket diaper -- they are built like a disposable, but with a pocket in the back for stuffing liners into to absorb wetness. GroVia hybrid diapers are a diaper shell with snaps. Cotton inserts that snap into place are sold separately and you can also use prefolds or flats -- traditional cloth diapers. GroVia also sells biosoakers -- disposable inserts for their shells. While pregnant and on modified bedrest, I had little else to do but research baby gear. 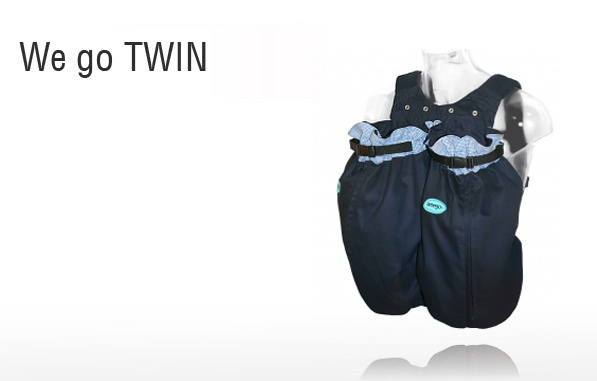 I decided that I needed one-size diapers -- diapers that could adjust as the babies grow. I didn't see the point in purchasing a bunch of expensive cloth diapers to have the babies grow out of them in a few months. I wanted them to be as user-friendly as possible. No pins, no horrible plastic pants that I remember from my sister's baby years. Velcro. Some offered snaps, but with my rheumatoid, I didn't think I'd be able to handle snaps as well. I purchased a stash of 4 Bum Genius 4.0s, a newborn sampler package, and 1 Gro-Via shell with 2 soakers and a pack of biosoakers. Honestly, I didn't expect to like the Gro-Vias that much. I bought them on a whim. At first, I didn't think the snap-in-soakers made sense -- why fuss with changing an insert when you could just change a whole diaper, like you would with a disposable? But D, the champion peer that he was, managed to leak out of every diaper that I tried -- except the Gro-Vias. But I loved the super-waterproof shell, made out of wet-suit material. And I realized that it was much less laundry to throw a soaker in the diaper pail than it was to throw in a whole all-in-one or pocket diaper. I could snap in a soaker while holding a wriggling, wailing newborn with one hand -- stuffing a pocket diaper was another matter entirely. Soakers were a fraction of the cost of a pocket or all-in-one diaper. I only had to change the shell every two days or so, or when it got dirty. I soon learned to rotate shells, giving one time to air out and always keeping a second on hand with a soaker already snapped in. I kept my Bum Genius 4.0s for overnight diapers and they've also served me well -- the velcro has just now worn out after months of heavy use. But the Gro-Vias pretty much have been my workhorses. I now have a stash of 45 soakers and something like 20 shells -- which lasts about 2 days for twins. I seldom use the biosoakers because they are at least as expensive (and slightly more in most cases) as traditional disposables. But when I can get some through a gift card or a trade online, I do. They are great to travel with. When I took O to Shriner's in St. Louis to have her foot looked at, I flew with her instead of driving. A pack of 50 biosoakers took up a fraction of the space traditional disposables would have. And biosoakers are compostable and much more environmentally-friendly. In the summer after the babies were born, GroVia came out with a new all-in-one. I bought one to try it. I have a love-hate relationship with it. I love how thin it is and how clothes fit over it. I love how easy it is to launder. But it's pretty stiff and the snaps are difficult for me. O uses it at night often, but I wonder how comfortable it is for her. My in-laws bought diaper liners for us from Babies-r-us. I remember thinking I wouldn't use them. Um, wrong! Using disposable, flushable liners means that most of the gross stuff can either go down the toilet or in the trash, not on the diapers. And when something -does- get on the diaper, I take the trash can that I use as a bucket to the shower and use the hand-held sprayer to clean. I empty the trash can into the toilet when done. People buy diaper sprayers that attach to toilets for this reason, but my shower works well enough. I don't dunk and swish like my mom had to! Grovia sells bioliners, but I think their texture is a little rough for my babies. I use Bumkins liners, although I've liked the Bummies as well. Oh, forgot to mention how they are just as cute as can be on my babies! I will be very sad when we no longer need them. I want to try to continue a little on twin gear stuff, because again, having the right gear makes things either possible or impossible for me, especially on gimpy days. But knowing that I can write forever on useless stuff (see post on the co-sleeper below) I'm going to try to consolidate gear reviews into annotated lists. I heard of things like the Angel Monitors and other SIDS monitors before I had the babies, but I scoffed at them. They were ways to prey upon new mother's fears and make money. Then I had the babies. And I totally think having a monitor might have saved me a few thousand trips to make sure they were breathing. The first few weeks, especially, I was so raw and nervous. Since I'd planned on having the babies sleep together, an under mattress monitor wouldn't have worked and I didn't know about these till later, when the babies were almost past peak SIDS time. These are small sensors that clip to a diaper and sound an alarm if it doesn't detect the baby breathing. Would it have really quelled my nerves? I don't know. I so wish I'd had this. I couldn't justify the expense for something used for such a limited time, but OMG this would have saved my life. I still wish I had a way of carrying both safely. If I'd only known. . . I've been a parent for 10 months now. We've all managed to survive. My life revolves around two little people who happily crawl around my house, squealing and tackling each other. I wanted to talk about what I would have done differently had I known what I know now, but it's sort of too soon for that -- at least concerning the big questions. I'm thinking more on the lines of stuff. My love for stuff stems from my love of AT, which came from having rheumatoid and trying to be a high school student. A pillow made sitting at wooden desks somewhat bearable. Foam tubing made it possible for me to grasp a pencil. Having the right baby stuff is the difference between an easy day and a miserable day, I've found out. And if you're broke and only temporarily employed, as I am, you can't afford to be picky. There's a lot of stuff that I bought that was useless, a lot of stuff I passed on that I wish I had, and some things that I found out about too late to make it worth my while to buy. I had a mini-co-sleeper that I got at a flea market, which is significantly smaller than the original. I just couldn't justify the $200 price tag for the original at the time. But man, I should have gone for the original. I used the heck out of my mini. Very soon the babies were too big to fit together so I put my daughter in a yard-sale bassinet and used the mini for my son, who had reflux. 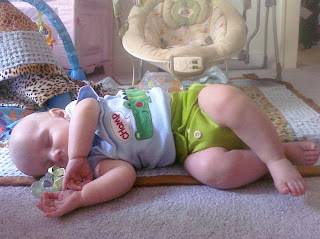 It was easy to adjust the legs to have him sleep at an incline. This model also converts to a pack n play when the babies are older -- a useful feature that extends the life and helps justify the price slightly. The mini co-sleeper came in an odd size that had me souring ebay for the expensive sheets. (I was convinced that anything but the manufacturer's sheets would smother my babies.) My mom inadvertently put a changing pad cover on the mattress and it fit perfectly. Word to the wise. My name is Lesley. With a 'y'. That immediately identifies me as a female from the midwest/South in her 30s or so. You can thank the character "Leslie" on General Hospital in the 70s for having the name cross over to female about that time. I always liked/hated the status of my name on the fringe of popularity. My sisters might find personalized toys at the stores, but I never did. My mother is Barbara. You can guess which decade she's from without knowing she's my mom. Smack dab in the middle of the Baby Boom. There were several Barbara's in her class. My kids were going to have unique names. Different. Not trendy. They might not be able to find a toys with their names on it, but that would be made up for by the awesomeness of whatever names I decided to give them. Explain to me why I have an Olivia. And how every one else in the world has an Olivia? (In fact, "Olivia" was the 4th most popular girl's name in 2010. )And it why doesn't occur to me to mind one little bit? It might have something to do with the pig. Ian Falconer's original "Olivia" book came out around 2000. I was working with J, who is non-verbal and liked to call classmates "pig" in sign language, giggle, and run off. J has Angelman Syndrome, a wonderful smile, and an inner life that I can only guess at. Olivia in the original book talked very little, mostly to negotiate with her mother over not wanting to sleep. She dreamed of singing opera and being in her favorite Degas painting. She wore people out. She reminded me so much of J with her mysterious inner life, her unwillingness to sleep, and her love for everyone and everything. 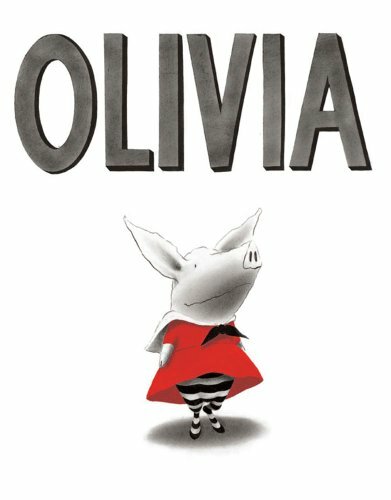 Olivia remained one of my favorite characters in kiddie literature, but I refused to look at any subsequent books, especially those spun off of the television show. My cousin had a baby girl and almost named her Olivia. When she changed the name the week before the baby was due, "Olivia" became lodged in my head as a name I liked. When I found out I was pregnant, I wrote "Olivia due" on my calendar on the due date. Of course, I did not know that I was having an Olivia with special bonus baby Dominic. It just seemed impossible to name her anything else. She was Olivia in my head from the moment I knew I was having a baby. If I'd had two boys, one would have been Olivia. Or I guess Oliver. On one hand, it's a tribute to J and her spirit. I think sometimes Olivia has channeled the fiesty spirit of both her namesake character and "Big sister" J who made me fall in love with the character. On the other hand, O is her own person and has been from the minute she was born, floppy and struggling to breathe but fighting off any attempts to help her. I like to tell people that she took on a team of doctors and nurses and won. Her little feet still have purple bruises from the IVs 6 months later. There's a toughness and a sweetness about her that's so fun to watch as she grows, even as I curse that stubbornness every time I put her down for a nap, cut her little toenails, or try to wipe her nose. At 2 months, we noticed that she wasn't just absently staring at the T.V. but that she liked watching hockey. At 5 months, I realized that she wasn't accidentally ramming her brother at full speed in the walker -- she was doing it deliberately and loving it. Even her ultrasounds showed her chewing her brother's foot, pulling her own ear, and shaking her head in protest in a way that I recognize over and over again now. So yes, everyone may have an Olivia. But no one else has my Olivia. And thank god she's been asleep long enough to let me write this.